Flour tortillas of the store-bought variety usually have a lot of questionable ingredients that leave an odd aftertaste. But some of the homemade flour tortillas I've had were greasy and rubbery (and some 1/4-inch thick! ), so I decided to try making my own with just four simple (and organic) ingredients. I made up the recipe as I went along, and they turned out great the first time--which only means homemade flour tortillas are easy and practically foolproof! Cooking for two on most days, I set out with the idea of making six smallish tortillas. So I got out a medium bowl, about 2 quarts, and measured in the amount of organic unbleached flour I thought would be needed. Not being too keen on lard, and having an actual aversion to vegetable shortening, I got out the organic unsalted butter. Started with 2 tablespoons but decided to add a bit more. Heated up 1/2 cup water, but didn't use it all; turns out, 1/3 cup is just right. Did all the mixing with my fingers, then kneaded the dough briefly right in the bowl. Couldn't be easier. 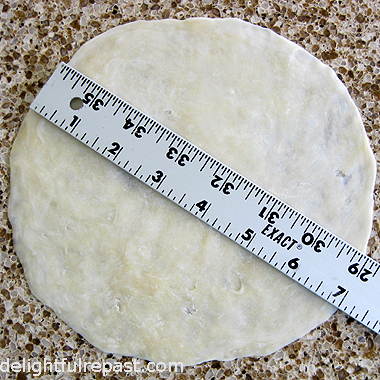 On my impeccably clean quartz countertop, I mashed the ball of dough into a 5-inch disk and cut it into six wedges. Then I rolled each wedge into a ball, threw them back in the bowl, covered the bowl and let the dough balls rest at room temperature for about 30 minutes while I proceeded with other parts of the meal. Then I pressed them out by hand on the same unfloured countertop. If I were making a lot of tortillas, even just a double batch, I would use a rolling pin. But for so few, it just seemed simpler to do it by hand. My little recipe made exactly six tasty little 7-inch tortillas. I know step-by-step photos would be helpful, but I don't usually have a second photographer on hand, so I've given very explicit directions and am confident you won't have any trouble turning out a batch of homemade tortillas the very first time. 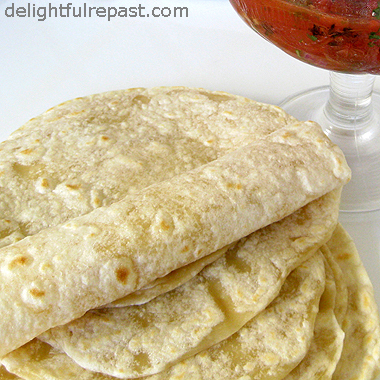 Mmm ... once you make your own flour tortillas, you'll never go back to store-bought! You might also want to try my Mexican Rice and Albondigas Soup recipes! 1 In medium bowl, mix flour and salt together with your hands. Grate the butter into the bowl or use a small knife to slice tiny pieces of butter into the bowl. With your fingertips, mix the butter into the flour until it resembles coarse meal. Pour the warm water with one hand while mixing with the other, in case you don't need to add all the water. The mixture should be just moist enough to come together into a stiff dough. Knead, right in the bowl, with one hand for about a minute. 2 On impeccably clean unfloured work surface, mash the ball of dough into a 5-inch disk and cut it into six wedges. Roll each wedge into a fairly smooth ball, place them in the bowl, cover and let rest at room temperature for about 30 minutes. 3 On the same unfloured work surface, with a rolling pin or with your hand, roll or press each dough ball into a 7-inch round. Measure--if they are not 7 inches, they are not thin enough. 4 Heat an ungreased skillet or griddle over medium-high heat. (You would love the Lodge Pro Logic 12-Inch Square Griddle. I hate round griddles!) Cook on first side about 30 to 45 seconds or until tortilla starts puffing up and is getting specks of brown on the underside. Turn and cook second side about 30 to 45 seconds or until browning in spots. As each one is done, stack on a plate covered with a kitchen towel. Mmmmm, I beth these are great! I love mexican food and making these tortillas doesn't take too much time either. Do they store well in the fridge? How about the freezer? I usually buy the "hand made" kind at Trader Joes and then freeze the left overs until I'm ready to use them. I would think they should keep well in the refrigerator for a few days if you double-wrap them. I've never tried freezing them. Don't see why not. If you freeze some, let me know how it works out. Just who do you think you're fooling? OK, you measured out that precise 7 inches to the micro-nano millimeter – very impressive – but that tortilla isn't round! So you could have missed by a smidgen on another diametric (is diametric a word?). Anyway, one of the few exceptions I'll make to my no-bread, no-potatoes is tortillas. And yours do look oh-so grand. Congrats on another Five-Cleaver coup. Doubt I can replicate this, if only because I do not have an "impeccably clean quartz countertop." Mine is sort of grungy-if-sterile, valley-of-the-moon, campfire grade lava. And please tell me why it is you do not have a second photographer. Is the beneficiary of all that gourmet repast all thumbs? You should take away his surfboard and his captain's hat and hand him something with a flash and a lens and very simple instructions. Just sayin’. p.s. and I just realized it's Friday the 13th. That means black cat for lunch. Shhh ... no one is supposed to notice that the tortilla is slightly out of round! I am relieved that it still gets Five Cleavers. Re the PS: We've been getting regular visits from a fluffy white (with a bit of black) cat that is exceedingly plump; suppose if you saw him you'd be imagining leftovers! JW, if you knew how long I waited for my enviable countertop, you'd know I *deserve* it! So be patient! But I do recommend quartz. I considered all the possibilities (yes, including granite) and decided quartz had all pros and no cons. Hope you'll try the tortillas soon! We've been hooked on homemade tortillas for about a year now. The taste is fantastic and so much better than store bought. I've never tried them with butter though. I usually make them with olive oil. I'm going to try butter next time just to see how they compare. Thanks! "Hooked" is the word! I haven't bought a single four tortilla since I started making these some time ago. I'm sure they're good with olive oil, too, but I'm a real butter lover. Hey, have you ever thought of doing a small video demo'ing some of your recipes? All you need is a cheap webcam, as it doesn't need to be hi-res, post it to youtube and link to it on your great blog. Then we can see the real-time action as you whip up your delightful repasts. Just a thought. Thanks, Grant! Perhaps I'll give that a go. Soon. Have a nice weekend, Jean. Thanks, Judy! Sorry about your computer. I feel your pain! Had a big computer mess myself last month. I will work on a gluten-free flour tortilla for you. I second the GF tortilla, I HATE the brown rice ones and when I want burritos, my mouth is NOT watering for a corn tortilla. Okay, Anonymous, I'm working on it. Be sure to visit my blog every week (I post just once a week, on Fridays, as a rule); I'll post a GF flour tortilla just as soon as I'm satisfied with my formula. You had me at "easy and foolproof." Your homemade tortillas look so mouth-watering! I know you say that it is very simple but that only means that it will take me twice as long as the average person to throw together instead of three times as long. Oh but they sure look worth the effort. Thank you for the recipe! Thanks, Ruth! And I hope you find the recipe to be those two things as well as delicious! Madison, thank you! I know you won't have any trouble with them! Hope your running is going well. I love this recipe I also avoid the store bought kind because of the unknown ingredients! Thanks, Catalina! I hope you'll try these soon. Wow Jean, those look absolutely incredible! I almost can't believe they're home-made, they look that good! I've never tried making them myself, but I've always wanted to because I love Mexican good SO much! Thanks for sharing this perfect looking recipe! Thanks, Charles! And don't worry if yours aren't perfectly round; the important thing is that they are thin. Hope you try them soon. P.S. My Mexican Mom told me that my tortillas 'salen mapas' or they come out shaped like a map. They taste good any shape! Thanks, Pegi! You've got some catching up to do! I don't cook a lot of fish, but I've been thinking about it lately. My mother (the world's greatest cook) made a fabulous batter, and I am going to try to duplicate it. Have you considered using mostly whole wheat flour? We love the extra flavor whole wheat provides. I use about 1/5 white flour and 4/5 whole wheat. Awesome! About the fat: We don't do lard or shortening either. And though I do love butter in my cooking, I try to use olive oil when I can. And this is one of the times it is perfect. It is an extra virgin olive oil and so it adds no heavy flavor but is very good. Just a couple of thoughts for you - must be feeling chatty today! Sorry! Makes up for the days I have nothing to say, I guess. Lily, don't worry about being too "chatty," I love it! No, I haven't tried whole wheat for these. I've thought of it, but it seems I usually make tortillas on the spur of the moment and always when I don't have any whole wheat flour on hand. I'll have to start planning ahead more! I always have extra virgin olive oil on hand, so I'll definitely try it. Sounds good to me!